Marla knocked on the steel door of her new job, entering quickly. 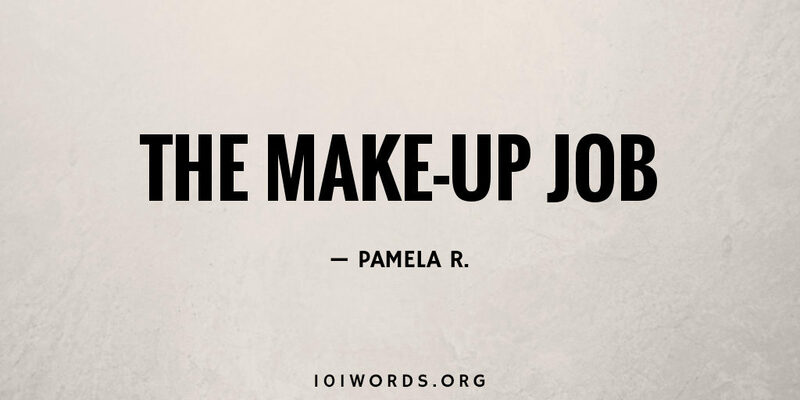 She had always dreamed of working in the make-up industry. Could she succeed? She excelled at hiding facial imperfections and smoothing uneven skin tones. Surely she’d be a natural here. Marla assessed her first client, prone in the pine box. Yes, she could return color to the face and hide the bruising on the jawline. Once she closed the woman’s eyes, no one would see the bloodshot traces. Confidence coursed through Marla. She would give dignity to the dead woman’s body and comfort to her family. I’m caught between respect and horror at Marla’s cold professionalism in the face of a very sad tragedy. Looking forward to more from this author! Another great read Pamela R. Keep ’em coming. Wow. Great short story with a surprising twist. I didn’t see it coming! Looking forward to more stories from Pamela R.
What a twist in such a short story! Excellent job. Love it! It was a surprise! Good one! For readers who guess the setting at “pine box,” the narrative could go directly to “Everyone starts somewhere,” maximizing the shock at the MC’s motives. Fifty-five words? But I like the well-chosen detail of the 101 story too. Either way works. Great read. The steel doors were an excellent hint, but still unexpected twist. Love it. Great foreshadowing. Masterfully done in such a challenging format. What a creative way to get your reader hooked! I would love to find out more about Marla, and her fascination with applying make-up to the dead! I’m intrigued and want to read more!! As an editor, I seldom expect to be surprised and delighted. This was masterful — I hope the author continues to share her talents. Congratulations.